Glowlab is pleased to present the writings of Los Angeles independent curator Chris Balaschak, who recently produced the Itineraries exhibition at Gallery Luisotti in Santa Monica. The show, which included the work of Glowlab's Christina Ray, was featured in the Los Angeles Times and Artforum.com. A review of the exhibition will appear in the October issue of Artweek. The following text accompanied the exhibition, and we will publish it in three parts. Included here is part one; part two will be published on September 15, and part three on October 1. In late 2001 three entomologists met at the Natural History Museum of Los Angeles. One in residence at USC, one a curator at the museum, and one a museum volunteer, the three formed a critical mass of similar interest. This common interest was purely entomological, a desire for spiders. The three colleagues sought to study spiders in greater Los Angeles, but the problem was how to go about this goal in such an ambitiously large area. The area, a vast and sprawling urban topography, is one part each desert, mountain, beach, and grassland. The natural environment is one of juxtapositions, not to mention the infections of global culture and economy. The solution was to create a local survey asking 'citizen scientists' to bring in the spiders they found in their homes, gardens and workplaces - no spider denied. The project, which originally was scheduled to last only one year, has spun its own web as collection continues now in 2004 with data continually being processed. The doors of the entomology department are always open to those wanting to bring spiders in, and the annual Insect Fair is the major cultivation point. The Los Angeles Spider Survey has been far-reaching, accepting spiders of all species from every point in the greater Los Angeles basin. Heading the project, Assistant Curator Dr. Brian Brown set a very pragmatic goal for the survey - to study spiders of the region while deepening the local specimen collection of the Museum. Like any great field research, the project has extended in time and space and, after processing data and collecting specimens, interesting results occur . The project suggested a liberated form of geographical investigation, whereby the survey could serve as a map able to open the landscape of greater Los Angeles. This map would express the complexity of the landscape while creating an intersection that becomes the museum's community. The spiders act as a mapping device to reveal another city, of an immense spider population, in a landscape one would presume to know. Assumptions aside, this map permeated greater Los Angeles revealing to its inhabitants that spiders of all exotic and common qualities, non-native and native, were hiding in wait throughout the city . The movements and exchanges of the citizen scientists drew this map that revealed both a diverse spider population as well as the lines between the citizen and the museum. Currently in process, Dr. Brown is planning to have all data composed to create a demographic map of the spider population of Los Angeles. Different sites in the city become nodes from which spiders were brought in heavy numbers- the centers of the spider city may appear to be as multi-centered as the human city. The Spider Survey divulged this other Los Angeles, a city of spiders, insinuating the unlimited potential cities awaiting similar projects. Drawing on a variety of individual interactions with the landscape, and with other fellow citizens, such a geographical investigation as the Spider Survey delineates the impossibility of creating a singular and common image of greater Los Angeles, revealing the site as susceptible to infinite mappings. 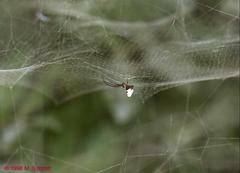 One node of heavily concentrated spiders was particularly illuminating to the Museum and the inhabitants of the region. In discovering a large population of brown widow spiders in the yard of a Torrance public school, this node was exposed to Los Angeles' human population. Literally nesting beneath benches outside the school the find was shocking, and perhaps terrifying to parents, as the lethal brown widow was known to inhabit only a distinct territory of East Africa . Most likely the spiders made their way to Torrance through the port of Los Angeles at Long Beach, a major mouth feeding the United States with innumerable shipments of cargo, acknowledged or not, arriving daily from all points on the globe . This shock should not surprise, especially in an era of global migrations between dense and diverse cities where goods, services and cultures know no geographical border. Greater Los Angeles is particularly exemplary of such capricious quality. As the Spider Survey imparts, there are as many centers to this city, as many cities in this city, as there are populations that live within its confines. Though many Angelinos have the Los Angeles County Thomas Guide (a common road map) on hand at all times to help guide them through the city, this is but one map of the variant paths, and potential cities, interweaving throughout. The Thomas Guide may lay down the common paths and routes bisecting the city, but it is not the city itself. This road map is a limited number of experiential cities, only an indication of the many paths and cities to be known in the area of greater Los Angeles. The Spider Survey maps one potential city, a city both distant and distinct to greater Los Angeles; one city among many that creates the complex urban web of the region. Movement, as seen in both the migration into the city of spiders and that of citizens from their backyards to the museum, is crucial in understanding and describing the polymorphous structure of greater Los Angeles. Movement permeates greater Los Angeles, marking its surface mutable. Each commute across the city, the movement of the individual back and forth between points, sets its own borders for the city. The state of greater Los Angeles is that of dislocation and commotion, a space of individuals commuting on numerous paths. Such movement is the mark of the global city as Walter Benjamin made note of this arising in 19th century Paris, with its "rootless populations of big cities" . Yet greater Los Angeles is even further exemplary of the rootless population; it is defined by the space of commuting, by the lines of individuals moving across its surface between points such as home and work. In greater Los Angeles especially, these points of home and work are unbound to a common centricity (as suburb to downtown). The commute is a line of circulation between points, while not statically bound to these points. Unlike Paris, Los Angeles is quite a young city and has matured with commuting already built into its growth. Though greater Los Angeles is often associated with the commute upon the freeway, which became a national occurrence during the post-World War II boom of suburbia, "the freeway system is the third or fourth transportation diagram drawn on a map that is a deep palimpsest of earlier methods of moving about the basin" . Freeway commutes lay atop the lines of regional and national railroad lines, Spanish trade routes, and ancient native footpaths, each instilling in the region a sense of transmigration. Greater Los Angeles is uniquely this commute-space, a space of variant lines of movement between many potential points. These points are each intersections, and each does not conform to oppositional terms of suburban/urban or periphery/center with which cities such as Benjamin's Paris often contend. However, the dream of suburbia was, and is, the reality of greater Los Angeles. Los Angeles is a site where every family could dream of owning a home with a yard - notably different than Benjamin's Paris born out of a crowded medieval urban core. The cunning marketing of real estate lords, in conjunction with clever railroad barons, made this dream reality for millions in the early 20th century, sprawling Los Angeles across the basin west to the Pacific, east to the desert, north to San Gabriel Mountains and south to Long Beach. Yet the breadth of such a spread created a space of variant lines with disparate intersections of the growing population, each intersection adding to a loss of centricity for the city. A patchwork of neighborhoods, each with main streets, became numerous crowded intersections dispossessing the centricity of the city at large. Rather than travel to a central space that the majority of citizens commute to, the greater Los Angeles commuter draws a line between many possible points. The commuter does not necessarily commute from a peripheral suburb to a central downtown but rather between many possible locations of home and work. Center and periphery have ceased to be issues in the geography of greater Los Angeles, as "Los Angeles has no urban form at all in the commonly accepted sense" . The loss of the issue of center against periphery leads to a model of equivalence where each commute line, every individual movement, is equal in defining the layers of greater Los Angeles' web-like palimpsest. Reyner Banham's "commonly accepted" city is that of London and a European urban model (equally applicable to cities such as New York or Boston, to cite examples in the United States). Such a model is focused on the creation of central intersections and radial lines leading out toward the periphery of the city, creating clear distinction between center and periphery, between a downtown and its suburbs. Greater Los Angeles is a city of linearity, a commute-space of movement between points of equivalence, not between opposing poles of center and periphery. Commonly attributed as chaotic and a "sprawling low-density single-family house monoculture,"  these claims are nostalgic for antiquated city forms of "the commonly accepted sense." Greater Los Angeles reveals a new order of urban form, a form of complexity due to the intricate itinerant motions of individual lines throughout the city. Greater Los Angeles is web where commutes can be traced to reveal the complexity of individual movements, opening potential paths for past and future experiences within the city; where the intersections of lines in the web become exchanges of these individual cities between citizens. To uncover this itinerant geography is to expose the complexity of greater Los Angeles and its move away from the assumed identities of urban form. Intrinsic to such a web-form is the impossibility of creating a singular image or perspective from which to encapsulate the city. Without center, greater Los Angeles is also without a definitive public face, a single image to commonly define the city. Though the Thomas Guide seeks to understand and make sense of the city's surface it too remains perpetually out of date and incomplete. No single map can suffice to capture the entirety of the city. The Spider Survey here is telling, as it is reliant on the movement of individuals, in the collection of spiders, to create an overall form of greater Los Angeles. The Survey is a continual and never complete, mutating for each new exchange of spider between citizen and museum. The borders of the Spider City shift for each new movement within. The Survey is reliant on the commute space of the city - the movement of the individual to and from the museum, as well as the exchange (the commute) of spider to the museum. 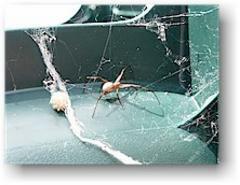 The discovery of the brown widow spider population caused a bit of hysteria in the local news. This hysteria was due to the unearthing of such an immense population of potentially dangerous spiders in a common landscape of the city. What could be a more common point on the map of the city than a public elementary school? The Survey presents the reality behind these common façades, that they are only a face, a front, to the building behind. That in this building behind a presumed common front, there lay many potential cities within greater Los Angeles to be discovered. The freeways and roadways of greater Los Angeles are presumed public space, yet here there are divergent faces of various linear movements, narratives of infinite cities. Dr. Brian Brown called the brown widow discovery "eye opening," as if we all were blind. The common landscape became something new, a place where deadly spiders played beneath benches of school children, where the assumed narrative of the city revealed unexpected stories of other cities. Though a map unveils an edifice that underlies a landscape, no map can tell the entirety of a given landscape. By definition maps focus on the particular in signifying a whole while not being that whole. Maps represent an intersection of public landscape and private experience where, for example, the road map shows us the routes one can travel, but does not reveal the individual experience. A map can signify any potential itinerary within a landscape, any experience of the city, and city within a city. Furthermore a map, a substructure to a landscape, is revealing about the composition of that city, signifying an unknown in the landscape as a place to be discovered. The Spider Survey acts as such a map, a city previously unknown in an all but presumed common landscape. Though the commute space remains perhaps the most public space of greater Los Angeles, a space to which a majority of its citizens can relate (as it is so central to life in the metro area), it is defined through private association and individual lines. The memories and futures of the city lie dormant in the commute space, a space of hidden lines left from various itinerant bodies. These itineraries await exchange with other bodies to unveil the commute space as a site of many potential cities to be experienced. 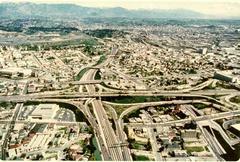 The freeways of Los Angeles, and its many roads and pathways, are a landscape presumed to be common. Yet as each individual commute traces its own path, the common landscape is forever distant from the individual landscapes that link together in the continually forming web of a polymorphous Los Angeles. Richard Sennett has referred to the city formed through commutes as having "fragmented geography," a landscape in which "the logistics of speed... detach the body from the spaces through which it moves" . Sennett explicitly refers to this reality as an effect of a city constantly commuting, "each fragment has its specified function - home, shopping, office, school - segmented by empty patches from other fragments" . The space between each fragment is indefinite, it is a space to which we have no direct relation and therefore cannot signify as a place, it is a between-space. Yet this space is the only common space between the individuals commuting in the city. Exterior to private interiors the commute space is the common landscape, where each individual projects upon different, at times divergent, trajectories. The individual relations to the space passed through are indirect, as we do not identify ourselves with them, yet we assume these spaces are the common landscape of greater Los Angeles. The individual relates to home, work, school, etc., but the individual does not relate to the space between these points, it is a space of façades only. If no one is relating to the places they pass, is there a loss of direct relation to the commute space that obscures all landscapes? To positively answer such a question would be to maintain greater Los Angeles as a fragmented place, a place without direct relations. Instead, greater Los Angeles is a place of infinite relations to the space surrounding it, infinite as relative to the numerous movements of commuting bodies along all possible routes at all possible speeds. Greater Los Angeles is this space of limitless individual places traced as linear commutes, each individual relaying, projecting and anticipating their place as they traverse the surface of the city. The narrative between these points, the linear movements of the commute back and forth, are the space of many potential cities to be exchanged between individuals. The commute space has, in greater Los Angeles, become this new common space that is always uncommon between individual movements, each individual forming the city along their commute. In a convergence of lines, intersections such as the Spider Survey become substructures for community relations. The web of greater Los Angeles is built upon such intersections. I interviewed Dr. Brown on January 15, 2004 regarding the project. The project was simply as pragmatic as I portray it here. The implications for curatorial methods and practice went far beyond the simple goals of the Survey, as did the resulting discoveries of non-native species. Dr. Brown mentioned to me that you are never further than 5 meters away from a spider in any landscape. The brown widow has also been discovered in Southeastern Australia in recent decades. Since this discovery the Survey project has taken into account the profound global influence on the native spider population of greater Los Angeles. The website, www.nmh.org, for the 2004 Survey makes the discussion and investigation of this globalism one of the key tenets for the project. Walter Benjamin, "Paris, Capital of the Nineteenth Century," trans. Edmund Jephcott, Reflections (New York: Schocken Books, 1978) 158. Originally published 1955. Reyner Banham, Los Angeles: The Architecture of Four Ecologies (Berkeley: University of California Press, 1971) 57. James Howard Kunstler, Geography of Nowhere (New York: Simone & Schuster, 1993) 213. Richard Sennett, Flesh and Stone (New York: WW Norton, 1994) 365-366. At the City Reliquary on Grand Street in Williamsburg, handwritten directions scrawled in a vertical column down one side of the building's brick face provide lost, wandering souls with a helpful map of the territory, offering directions to/from the major landmarks (McCarren Park, the Bridge) and intersections (this way to Bedford, Metropolitan, Roebling). 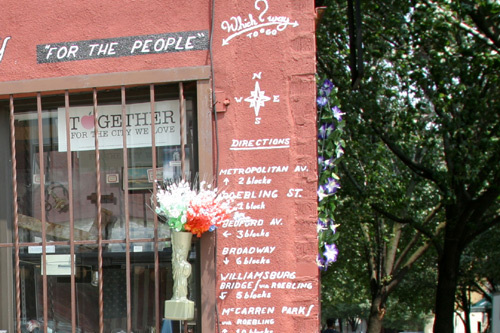 "For the people" reads a sign lettered above windows crammed with lovingly arranged displays of eyecandy junk --penny collections, crumbling statuary, plants in bathtubs-- and indeed, there is something about this unasked-for, impromptu street guide that embodies a certain indefatigable generosity of spirit. It's the impulse towards community reduced to its basic unit. This is cartography at its most lo-fi: words on a wall. 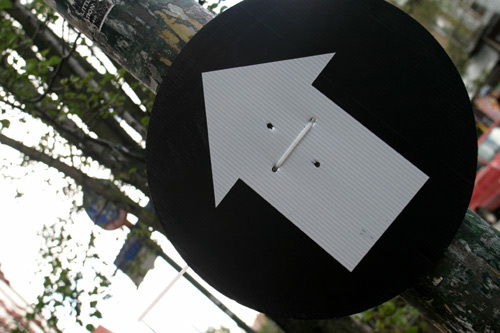 Signs and symbols used to aid, to direct, to point out, to show the way, anonymously and free to all, and to say to whoever makes use of it: you are here. There's something more here than just a warm-and-fuzzy random act of kindness, however. 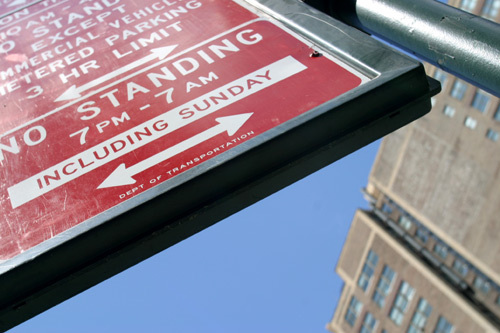 As a personal take on mapping the immediate landscape, the City Reliquary's DIY signage serves not only as a guidepost for the direction-impaired, but signals what matters in the surrounding environment. And like graffiti, it seeks autonomy, a way of personalizing that environment. At a time in which our everyday landscape is increasingly mediated and ad-saturated, in which we slog daily through a densely cluttered visual and sonic landscape of loudly competing messages, it comes as no surprise that more and more artists are looking for ways to simplify, make sense of, and organize the chaos rather than simply to add to it; and to find ways to use commercial symbols and language in individual, personal ways. At the same time though, technology blurs these distinctions, and there are tensions between where one ends and the other begins. How are our visions and understandings of landscape created and how do they affect the way we then alter the landscape to fit that vision? How do communication technologies affect our perceptions of territory? In what ways are languages tied to experiences of the landscapes their speakers inhabit ? The YellowArrow project offers a unique example of an ambitious, expansive project that explores some of these questions. It blurs the line between public and private space, between the lowest of lo-fi and the possibilities afforded by technology. 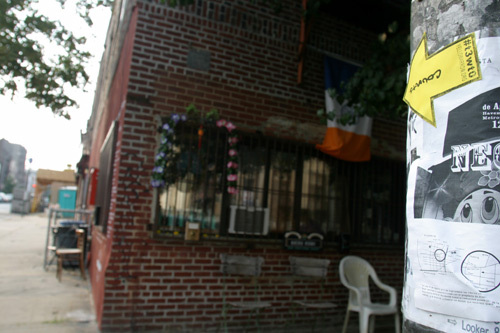 Using one of the simplest and most universally recognizable graphic symbols --so ubiquitous it seems to have always existed -- a loose-knit group of artists, promoters, and new media types aims to saturate the environment in an effort to create "real-life hyperlinks" and a way for people to interact with the environment in new ways. 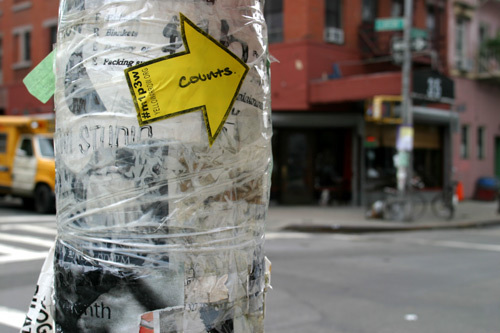 The idea is why-didn't-I-think-of-that simple: paper Yellow Arrow stickers printed with the word "counts" and an ID number are strategically distributed; participants use the stickers to "tag" points of interest or places of personal significance, and use the ID number to leave a short note, directive, or anecdote which others can read by typing the number into THEIR phones. The bright yellow stickers are all about visibility: they effectively create a visual plane upon which seemingly random things are grouped together at a remove from the surrounding environs. A favorite deli, a park bench that affords a particularly beautiful view, a piece of funny graffiti that might go unnoticed, these are the kinds of things that might be singled out. The arrows function as a kind of visual annotation, a header or footnote, a labelling of some particular element as “special” -- in some way, to someone, somewhere. I spoke to two of the artists involved in the project; their desire to remain anonymous brings up another concern: issues of authorship. The Yellow Arrow looks like a great equalizer -- it's a tool to be used, that's all, a way to foster communication and collaboration; it's about whatever individuals decide to do with it. No doubt it could be ideal as a simple form of advertising or promotion for someone's space or event; but it's uniquely suited to the creation of real-time, real-life narratives, and possesses fascinating potential --hopefully to provoke amazing stories, observations, images, and memories. [note: If you're in NYC next week, pick up YellowArrows and participate in the project: details here.